Ideally a balanced and varied diet, including plenty of different colored fruits and vegetables, beans, nuts, fish, lean meats, dairy or equivalent alternatives, and whole grains will meet your body’s nutritional needs. But, not everyone eats this way every day and many people may have special nutritional needs that exceed their diet, especially if suffering from illness or on medications that cause nutrient depletions. A basic multivitamin and mineral supplement can be a way to help fill in some of the gaps, but it won’t completely undo damage from a junk-filled diet! Some vegetarians, vegans, or diets that omit whole food groups (such as carbs). 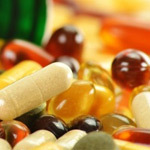 Most vitamins in a multi should be in the range of 100% with a few exceptions such as some of the water-soluble B vitamins or vitamin C. Avoid supplements that contain mega-doses of vitamins unless you are under the care of a health professional for specific nutritional needs. When it comes to minerals such as calcium, magnesium, and iron; they are better absorbed by the body if “chelated” to an organic molecule such as an amino acid. Vitamin A- Look for multivitamins with no more than 3000 IU of vitamin A in the retinol form. Beta-carotene is obtained from plant-based sources and can be converted into vitamin A in the body. Higher doses of the retinol forms of vitamin A can be toxic to the liver, cause birth defects, and increases the risk of hip fractures in older adults. Diabetics and those with hypothyroidism have a reduced ability to convert beta-carotene to vitamin A in the body, and smokers should avoid beta-carotene supplements do to a potential increased risk of lung cancer. Folic Acid- Women of child-bearing age need a multi with a minimum of 400 micrograms of folic acid/day to reduce the risk of neural tube birth defects. Adults over 40: New research suggests that too much folic acid (not folate from veggies/fruits) could actually raise the risk of certain cancers in doses greater than 800 mcg/day from vitamins. Look for multivitamins with less than this amount unless otherwise recommended by a health professional. Vitamin E According to the Linus Pauling Institute, nearly 90% of people age 2 and older do not meet daily vitamin E requirements from food intake. Look for the natural form of vitamin E which is d-alpha tocopherol at 100% of the RDA in your multivitamin. Vitamin DMost multivitamins contain 400 IU of vitamin D. Look for the “D3” form (cholecalciferol) instead of “D2” for better bioavailability. The American Academy of Pediatrics recommends all infants and children take 400 IU of supplemental vitamin D daily. Some adults and children may need additional supplementation from individual vitamin D supplements for optimal health. Calcium, Magnesium and Potassium- You won’t find much calcium in your daily multi. It is just too bulky, unless you don’t mind taking many servings per day, and it can block absorption of iron. Stick with food sources and/or separate calcium supplements. There also won’t be much potassium in your multi either. You will need to eat fruits, vegetables, dairy, nuts, and seeds to get adequate amounts of this vital mineral. Magnesium is a mineral lacking in the diets of many and some common medicines can increase magnesium depletion. Look for supplemental forms of magnesium ending in “ate” such as glycinate, malate, or citrate for better absorption. Up to 350 mg/day of supplemental magnesium may be taken without digestive side effects. You likely won’t find that much in a “one-a-day” type multivitamin. Iodine- While too little iodine can cause hypothyroidism, excessive amounts of iodine are not recommended. Look for 150 mcg of iodine in your daily multivitamin (100% RDA). The American Thyroid Association recommends a daily prenatal vitamin containing this amount for pregnant and breastfeeding women as babies are particularly vulnerable to inadequate levels of iodine. Iron-If you are a man or post menopausal woman you do not need iron in your multi, unless recommended by a health professional for medical reasons. Also, if you have the hereditary condition of hemochromatosis you will want to avoid excess iron. Menstruating women and children do benefit from iron-containing multis in general. Chelated iron in the form if iron bis-glycinate may be better absorbed by the body and may be less constipating. Everyone’s nutritional needs are unique, based on your diet, age, gender, overall health, and genetics. Health professionals knowledgeable in nutrition can assess your individual needs and make specific recommendations. Please talk with your health care professional if you are currently being treated for a medical condition before making changes to your current regimen. Relative effectiveness of iron bis-glycinate chelate (Ferrochel) and ferrous sulfate in the control of iron deficiency in pregnant women.